Eighty-seven years ago today, on October 19, 1924, the Packers welcomed their intrastate rivals the Milwaukee Badgers to City Stadium. 1924 Green Bay Packers vs. Milwaukee Badgers Program - Only Known Example! Up until only a few years ago, no Green Bay Packers 1924 one-sheet program was known in the hobby. However, on a typical day at a popular "Titletown" antique shop, that day turned into an important collectible discovery when a small handful of of early 1920's programs walked through the door, and that missing piece of Packers history made an unprecedented appearance. 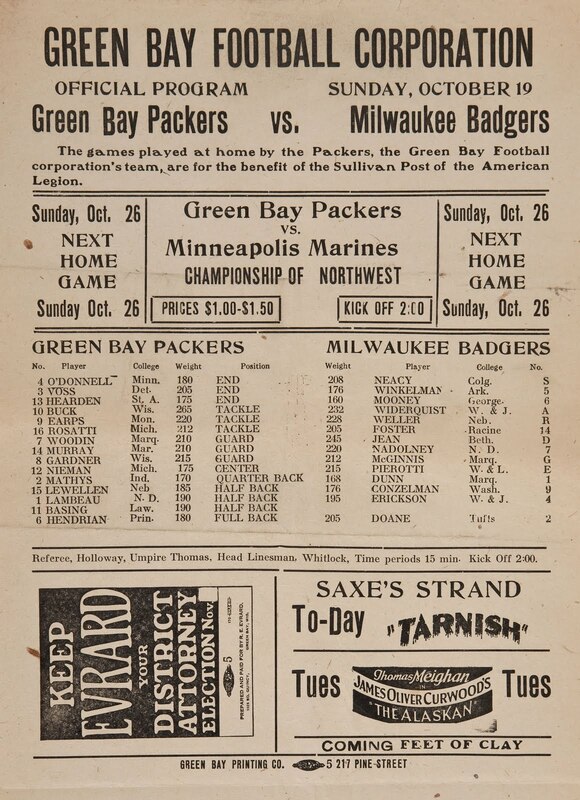 Offered here is an original 8.75x11.5" program, issued by the "Green Bay Football Corporation" for the October 19, 1924 meeting between the Packers and Milwaukee Badgers. The game ended in a 17-0 victory for the home team Green Bay squad at Bellevue Park, in front of a typical crowd of approximately 4,000-5,000. This amazing gridiron treasure exhibits EX quality, with minor folds throughout. 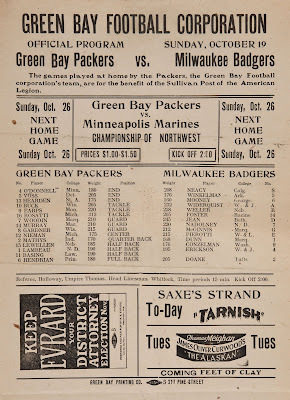 Its front displays both teams' rosters, including important names such as Lambeau, Buck and Lewellen, while the program also displays an advertisement for the Packers' Northwest Championship future meeting versus the Minneapolis Marines. A remarkable piece, which we are sure even the most discerning Packers collectors have yet to see. Guide Value or Estimate: $2,000 - $3,000. I'm intrigued not only because it's a rare look at the 1920s Packers, but also because of the glimpse it offers of the Badgers, the Cream City's short-lived entry in the young National Football League, who made their home at Borchert Field. There's also the added interest of the "Championship of Northwest". What other teams might have been involved in that race? There were several teams representing "northwestern" states by the 1924 NFL's standards. Minnesota had the Marines and the Duluth Kellys. Wisconsin had four teams in the league at the time; the Packers, Badgers, Racine Legion and Kenosha Maroons. Then there were the two Chicago teams, the Rock Island (Illinois) Independents, the Hammond Pros in Chicago's Indiana suburbs and any number of local semi-pro or independent teams that could have wanted in on the action.